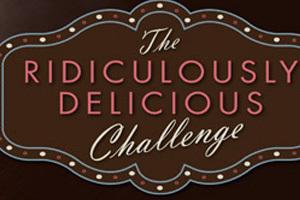 The Ridiculously Delicious Challenge is On! When we announced the RD contest in mid-October, we said that anyone who won, hosted or judged a contest for the rest of the year would be eligible to compete. A lot of challenges/contests means a lot of eligible people. Below is the initial list of challengers, but I’ll probably let a few others who collaborated with us last year in on the fun (so email Justin if you think you should be in). This is a multi-stage, winner-take-all challenge where the last challenger standing gets to pick their prize! In fact, that’s your first assignment! What ridiculously delicious thing would you do with them if you won? Your answer needs to be posted on your blog by February 7th. If you don’t have your own blog, e-mail it to Justin (at) marxfoods (dot) com and we’ll post it on ours. Be careful which three you pick, because they’re the prize you’ll win if you are the last challenger standing! The Marx Foods staff will select the top 20 (or maybe a few more at our whim) responses for advancement, and we’ll send you a mystery box of ingredients for use in the next round. There are no rules really as to what you need to post, but whoever makes us drool, laugh or wince the hardest is the likeliest to advance. By February 14th we will ship (via ground) each of the 20 or so advancing challengers a mystery box containing eight ingredients. They will be asked to use two of the eight ingredients in an original dish and either publish it on their blog or e-mail it to Justin (at) MarxFoods (dot) com by February 25th. From March 1st through March 4th we will run a reader poll on the Marx Foods blog. The 15 recipes that get the most votes will advance. Click here to see the Stage 2 Recipes! For Stage 3 the 15 top vote-getters will “make over” the recipe of their choice from any of the other 15 top vote-getters, except their own. In their post, they must also specify which recipe would have been their second choice for a makeover. The contestants whose recipes are the 8 most made over will advance to the next round. (to be clear, by making over someone’s dish, you are voting for them to advance to the next round). Also, two of the contestants who did the best job making over their chosen recipe will also advance to the next round (as judged by Marx Foods). If there is a tie in the number of times a recipe is made over, or if fewer than 8 recipes are chosen to be made over, the tally of “second choice” comments will be used to determine additional contestants. If there are still fewer than 8, Marx Foods will choose additional contestants. For the make-over, contestants must use 3 of their remaining surprise ingredients (not including the two they used for their own original recipe). Contestants should feel free to interpret “makeover” inclusively, as long as the made over dish relates in some obvious way to the original. Make over the dish by going high-end with it … or by making it rustic. Twist the flavor profile, re-imagine it, or reinterpret it. Make it your own. We’re not sure what sort of arcane magic Sue used to transmogrify waffles into corndogs…but we like it! Plate Fodder mirrored the basic elements of Eats Well’s original recipe (waffle, crispy chicken, sour-sweet sauce) while taking them in a very different direction. A strong submission and an excellent example of a re-make true to its roots while striking out for new territory. On March 16th we will ship all ten remaining challengers one very special perishable ingredient via Fedex Overnight (arriving 3/17). They will be asked to use that ingredient to create a final ridiculously delicious recipe. Submissions will be due by March 27th. On or before March 30th we will post a round-up on our blog linking all ten recipes. All Stage 2 challengers (see the list here) will be asked to select the TWO recipes they find to be the most ridiculously delicious. In addition, five members of the Marx Foods staff (Justin, Katy, Ryan, Matthew & Angela) will each select the FIVE they find to be the most ridiculously delicious. (Up to 40 challenger selections + 25 MF.com selections = up to 65 votes total). Only votes submitted by April 3rd at 23:59:59 PST will be counted. The challenger who gets the most votes will win a case each of the three products they wrote about in their Stage 1 post. On April 5th we will announce the results. In the event of a tie, Justin Marx will act as the tiebreaker. * This is the largest, most complex contest we’ve ever run, so please bear with us if we have to move a few dates. Having said that, we will endeavor to stick to the schedule. Thanks for including us again Justin! Looking forward to the challenge, although it will be hard to pick just three items from the list. For Round 3: The ingredients in the original dish that you are making over are irrelevant. You can reuse those ingredients. You just can’t reuse the 2 ingredients you used in your own original dish. The answer: Participating in Round 3 is a prerequisite to advancing to Round 4. If you do not remake a dish in round 3, you cannot advance no matter how many times your round 2 dish was remade. I am truly impressed with the voting mechanism for Round 4. Very creative and fair. Great job! Congrats to everyone who made it into the next round! And thanks to Justin for sponsoring this insanity. This was a heck of a lot of fun, and I’ve got some new recipes I’m going to have to try pretty soon. Good luck to everyone with that … thing … that’s going to be shipped.